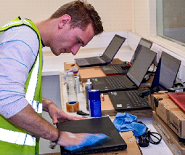 WAM offer a full and flexible refurbishment service for IT and consumer electrical returns. WAM utilise experienced engineers who apply their skills across a wide range of products and can deliver high yields on most product categories. Our technical expertise allows us to deliver board level repairs to most high-ticket items. 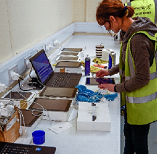 We are fully equipped to process hi-tech products from LCD TV's to Laptops and Tablets and by re-using parts from failed units WAM can deliver high yields at the lowest cost. Where WAM excel is through supporting retailers and manufacturers who experience recurring returns and are looking for a simple and cost-effective end-to-end solution. WAM are able to provide a complete solution from collection to re-sale, delivering unbeatable financial returns for this stock, and removing any further cost impact. What's more we will take on the warranty so ensuring this stock does not re-enter the supply chain. Meeting your obligations under the WEEE Legislation is mandatory. WAM ensure that all scrapped units are disposed of correctly on your behalf. Appropriate transfer notes can be provided, as required. WAM Europe are fully compliant with all relevant UK and European waste management legislation. WAM are registered with the Environment Agency allowing it to carry out the storage, repair and refurbishment of Waste Electrical and Electronic Equipment (WEEE) under a Waste Exemption T11 Registration of the Environmental Permitting Regulations 2010 (Reference NC2/061219/2018). WAM are also registered for the storage and handling of hazardous waste (OCE 193). WEEE to be scrapped is sent out for onward disposal to a registered waste treatment facility. WAM Europe have been a valued partner to Kensington for several years, assisting us in the discrete remarketing of our excess and end of line ranges. Their speed of response, and their ability to protect our usual channels is second to none. With their assistance we are able to bring in our new ranges earlier and be faster to market.